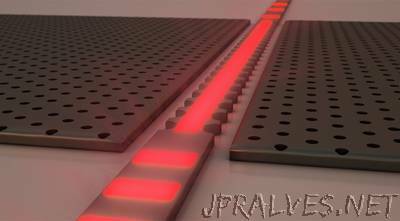 In 2015, researchers at the Harvard John A. Paulson School of Engineering and Applied Sciences (SEAS) developed the first on-chip metamaterial with a refractive index of zero, meaning that the phase of light could be stretched infinitely long. The metamaterial represented a new method to manipulate light and was an important step forward for integrated photonic circuits, which use light rather than electrons to perform a wide variety of functions. Now, SEAS researchers have pushed that technology further – developing a zero-index waveguide compatible with current silicon photonic technologies. In doing so, the team observed a physical phenomenon that is usually unobservable — a standing wave of light. The research is published in ACS Photonics. The Harvard Office of Technology Development has filed a patent application and is exploring commercialization opportunities. When a wavelength of light moves through a material, its crests and troughs get condensed or stretched, depending on the properties of the material. How much the crests of a light wave are condensed is expressed as a ratio called the refractive index — the higher the index, the more squished the wavelength. When the refractive index is reduced to zero the light no longer behaves as a moving wave, traveling through space in a series of crests and troughs, otherwise known as phases. Instead, the wave is stretched infinitely long, creating a constant phase. The phase oscillates only as a variable of time, not space. This is exciting for integrated photonics because most optical devices use interactions between two or more waves, which need to propagate in sync as they move through the circuit. If the wavelength is infinitely long, matching the phase of the wavelengths of light isn’t an issue, since the optical fields are the same everywhere. But after the initial 2015 breakthrough, the research team ran into a catch-22. Because the team used prisms to test whether light on the chip was indeed infinitely stretched, all of the devices were built in the shape of a prism. But prisms aren’t particularly useful shapes for integrated circuits. The team wanted to develop a device that could plug directly into existing photonic circuits and for that, the most useful shape is a straight wire or waveguide. The researchers — led by Eric Mazur, the Balkanski Professor of Physics — built a waveguide but, without the help of a prism, had no easy way to prove if it had a refractive index of zero. Then, postdoctoral fellows Orad Reshef and Philip Camayd-Muñoz had an idea. Usually, a wavelength of light is too small and oscillates too quickly to measure anything but an average. The only way to actually see a wavelength is to combine two waves to create interference. Imagine strings on a guitar, pinned on either side. When a string is plucked, the wave travels through the string, hits the pin on the other side and gets reflected back — creating two waves moving in opposite directions with the same frequency. This kind of interference is called a standing wave. Reshef and Camayd-Muñoz applied the same idea to the light in the waveguide. They “pinned-down” the light by shining beams in opposite directions through the device to create a standing wave. The individual waves were still oscillating quickly but they were oscillating at the same frequency in opposite directions, meaning at certain points they canceled each other out and other points they added together, creating an all light or all dark pattern. And, because of the zero-index material, the team was able to stretch the wavelength large enough to see. This may be the first time a standing wave with infinitely-long wavelengths has ever been seen.